Nevertheless, it is not that easy for product owners to create a product roadmap from scratch. When I started as a product owner, I had the same problem. First, I didn't understand the value of a roadmap. Second, I wasn't able to create one out of a huge backlog. In my first year as a PO, I learned how to create a product roadmap from the backlog using story mapping. Since this point I am using story mapping to introduce major features in my software tools and to kick off private side projects, e.g. for an Alexa skill for Amazon Echo.. And I totally love it! In this blog post, I summarized all basic steps on how to create a user story map for your project, software, product or app. Each chapter ends with an exercise and shows a story mapping example. This will help you to create your first agile user story map. P.S. : There are also resources for story mapping examples if you don't want to start with your own project! 1. What's User Story Mapping? User Story Mapping is the activity of breaking down big things into small things. A user story map helps to visualize a complex product. If created within a team it, helps to create shared understanding much better than classic requirement documents. Ordering user stories according to their importance and assigning it to specific user interaction with the product helps to discover dependencies and to remove unnecessary features. Create a better understanding in your team about your product, project, feature or app. Quickly get to your customers defining reasonable product increments. Analyze user stories according to their real value proposition. Validate assumptions to create the right product for your audience. I honestly think that story mapping is one of the most valuable techniques for product prioritization. Because, it is one of the most effective and comprehensive tools I learned in the last years. It is simple and effective at the same time. 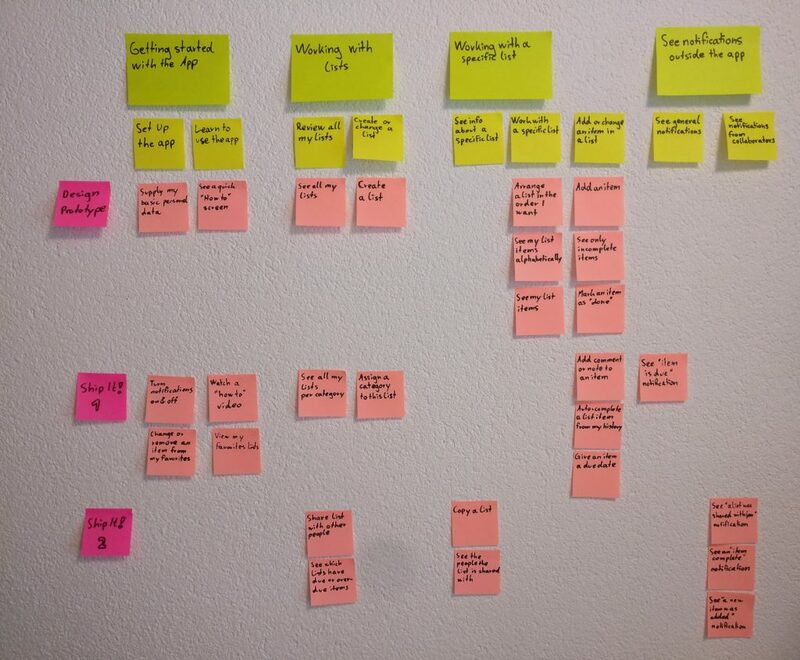 I got to know user story mapping in my first year as a PO. Since then, I am creating story maps for everything! Ok, you might think this is exaggerated? Actually, it's not! I am always considering to create a story map if I have to break something down. Building feature after feature is not enough. That's the reason I created this blog post on how to create a user story map. So, whether or not you’ve heard about user story mapping, the story mapping example will help you to apply user story mapping on a real-world problem. Never forget! Putting something into practice is the key to learning. You’ll want to pay attention and do the exercise for each chapter. In case of any questions, don't hesitate to send me your questions. Just a heads-up though. The lessons are pretty packed with information, so you might want to set aside some time to go through the lessons. Each lesson should take you 10 to 30 minutes to complete. This is a short introduction into the story mapping tools you need. If you are working for a bigger company, you will probably have your supplies already available. Otherwise, I recommend to order some on the internet right now or go to your local office supplies store to get them. As you see, I am a big fan of creating user story maps in the real world. I didn't use any online tools for story mapping yet. Personally, I really like the Realtime Board as I am using it for Retrospectives as well and it is quite flexible. Get at least 3 different colors of sticky notes. It helps you to structure the story map and looks nice. Don't pick too small ones. 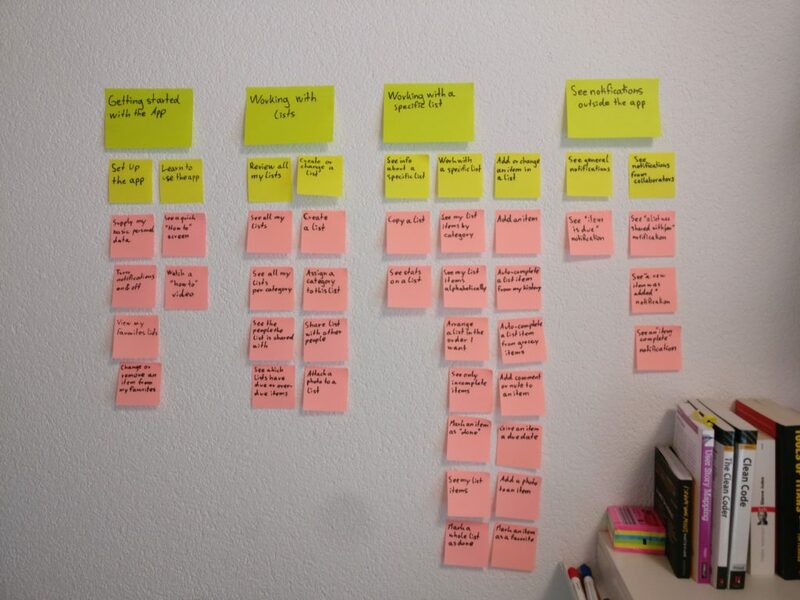 Even if you want to create a user story map on your desk, I recommend you to use at least a size of 15 x 10 cm. Okay, now it is time to create your first user story map. To get started you need to define the topic of your story map. Don't worry about what to pick. You can create story maps for various things. Most important: Your starting point should be the main user activity you would like to solve with your product, app or service. The first story map I created was about making a reservation in a restaurant. The challenge was to create a minimal viable product that included the most important features. You can also pick a bigger feature, epic or app you will start soon to create your personal story mapping example. In the next chapter, you will learn how to break this user activity into a sequence of user actions similar to a Customer Journey Map. You don't have a topic to create a user story map? No problem! You can also start with an story mapping example created by Jeff Paton, the inventor of story mapping. The example is about creating a to-do list app. You can find the download link on his page. Your mission for today, is to come up with a topic for creating a user story map. Create a list of 3-5 topics you are currently working on and pick one to create your first story map. Once you’ve picked a topic, you can send me your topic to get feedback. If you are having trouble deciding, send me a few ideas and I’ll pick one for you. Don't be afraid to pick a topic right now. I guarantee you will get some new insights, no matter which topic you choose. The result will be a simple user story map that sorts user stories according to their corresponding user actions. The starting point of every story map is a user journey, process or a sequence of user actions. Now, start with breaking down your activity into 3 to 5 user actions. These actions will frame the skeleton of your story map. Ideally, the user actions complete the activity in an end-to-end fashion. If you picked a problem or feature, you need to think about how your users would use your application. Define the 3 to 5 user interactions with your application. Don't bother about different users right now. Pick one example user and use it for creating a story map from this user perspective. Initially, you might struggle to identify the right activities. This is not a problem as you can add, remove, split or merge activities while creating the story map. In the next step, you need to think about user stories. Brainstorm potential features your user demands. Don't decide if features are important or "nice-to-have". Think about functionality your user needs, to solve the problem end-to-end. Focus on stories that are required to complete the defined user actions. As a blog author, I want a fast editor to write posts quickly. Personally, I leave out the user group "As a blog author" on sticky notes to save space. Anyway, you should really focus on one user group right now. Now, brainstorm at least 15 user stories and write them on sticky notes. Take your user stories and assign them to the user actions. Put all user actions next to each other (left to right) and sort your user stories according to the user actions they belong to. For inspiration, you can check out an example I created for an Alexa skill. Your homework for today's lesson is to send me the user actions you defined. Please, tell me if you experienced any other difficulties doing this lesson. I will be happy to help you. Now, we’ll start prioritizing the user stories in your story map. The goal is to define your first minimal viable product (MVP). Defining your first MVP gives you the opportunity to validate whether if you are building the right thing. Define a version of your product that provides benefit to its users but requires minimal effort to build. After building a simple version of your product, you can use it to do a test run. In the end the user decides what's working for him. In fact, even a single user can give you important feedback about your product. This helps you to fine-tune your product idea. For this course, I recommend you to define a "traditional" minimal viable product. Focus on providing an essential benefit for your target user. First, we need to estimate the effort required to build a user stories. This is important for the ranking later. A very common way to estimate user stories is to assign a number to each of them. These numbers are so called story points. The best practice in the Scrum community is to give story points with values from 0.5 to 100. Story points are no absolute numbers. Pick a reference user story and estimate it with 3 story points. Now you can iterate through all user stories and assign story points. Common values are 0.5, 1, 2, 3, 5, 8, 13, 20, 40, 100. The increasing distance between the estimates considers that big features can't be estimated precisely. Let's do a short ranking exercise. Rank all user stories within their user action according to their effort. The fewer the effort the higher you need to rank the user story. If you would pick the user story with the least effort for each action, would you be able to build a great product? Yes? This is great. You are very lucky! No? No problem. It is quite unlikely that the smallest features of your product to create a reasonable MVP. In the end, you need to find the trade off between minimal effort and providing benefit to your user. This is the point were you need to experiment a little. If you are struggling, it can be helpful to recall what is the core of the problem you want to solve. Don't focus on to much of the surroundings. Keep it as simple as possible on a technical level. Story Mapping Example: Fourth, sort the stories according to their size, priority and end-user value into product increments to define your MVP. Update your user story map to visualize your MVP. Simply, visually separate the user stories you need for the MVP from the others by leaving some vertical distances. You can also add another color of sticky notes titled "MVP" and "Rest". Basically, you have two product increments now. The first one is a small MVP and the other one the full product or feature. Take a picture of your story map and send it to me to get feedback about your MVP. You can either send me a mail or send it using Facebook Messenger. I am also interested what was YOUR motivation to learn about user story mapping or building an MVP? How is your experience with this course?